I was very happy to be invited by Fr. José Funes, S.J., the director of the Vatican Observatory, to help out at the summer school. My auspicious title was “faculty assistant”— that is, a liaison between the faculty and the students. In particular, I acted as a guide to the students for the research projects that they were assigned, and also made sure the necessary technology was purring along. Each day, there is a full morning of lectures, and afternoons are left free for the students to work on their homework and to recreate. Throughout the school there were short presentations from the students on their home countries and their own research. But in addition to academics, there were opportunities for other cultural experiences. Each weekend we took a field trip together, and over the course of the summer school were able to see Assisi, Florence, Siena and Ostia Antica. The town of Albano, next to the papal summer residence on whose grounds the Observatory is located, is itself a charming place. Finally, many of us took advantage of the proximity to Rome to take in the culture there. 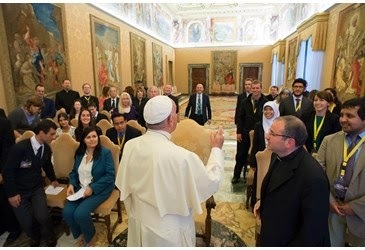 The Vatican Observatory School in Astrophysics is … a place where young people the world over can engage in dialogue and collaboration, helping one another in the search for truth, which in this case is concretized in the study of galaxies. This simple and practical initiative shows how the sciences can be a fitting and effective means for promoting peace and justice. I would also encourage you to share with people in your own countries the knowledge about the universe which you have acquired. Only a fraction of the global population has access to such knowledge, which opens the heart and the mind to the great questions which human beings have always asked. Part of the reason, then, that the school was a contribution to justice and peace, is that it provides an opportunity for the dissemination of scientific knowledge. Some of the students at the school were from countries where astrophysical research barely exists or is underfunded, and they will be able to contribute to building it up. Others, who come from countries with more well-established research centres, may be able to continue that heritage. In both cases, sharing “knowledge about the universe” is a part of justice and peace. Politics, economics and activism are means, not ends. Justice and peace are only truly realised in a culture in which people are free and capable of exploring the world they live in and are united in a common pursuit of truth. For it is only when we have engaged with the “great questions which human beings have always asked” that we can have any basis or motivation for even desiring a just and peaceful society.